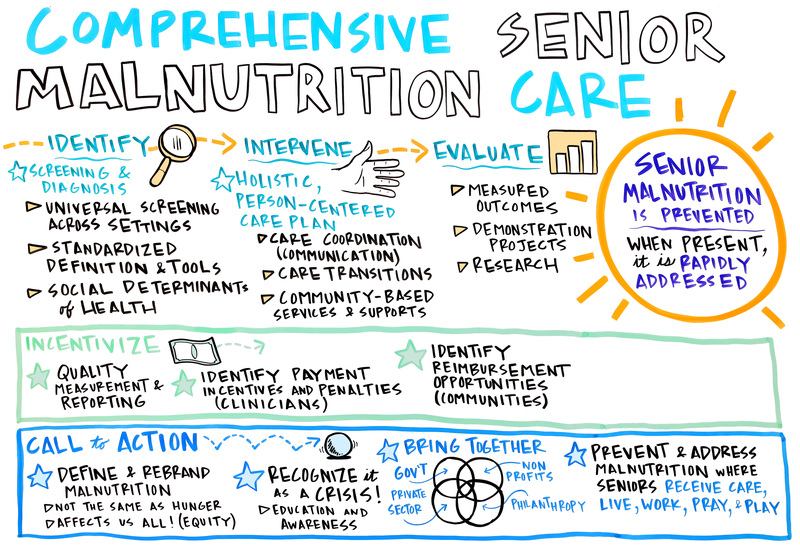 On February 8, 2018, West Health convened a Senior Malnutrition Visioning Session in Washington, D.C., engaging national leaders in healthcare, aging, senior nutrition, policy and research to share constructive dialogue and exchange innovative ideas to advance comprehensive malnutrition care and prevention for seniors through practice innovations and community-based solutions. The output of the session was a multi-year roadmap that was later shared with a broader audience during the Aging in America Conference in San Francisco on March 28, 2018. Through improvements in the identification of senior malnutrition and risk for malnutrition, community intervention, evaluation of best practices and research, and advancing policies that provide incentives for quality measurement and reimbursement for malnutrition-related activities, the incidence of senior malnutrition can be reduced—thus averting an ever-growing threat to successful aging.